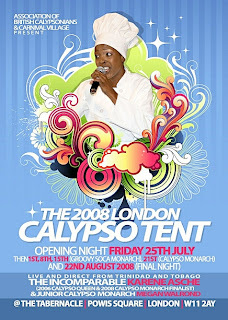 The London Calypso Tent run by the Association of British Calypsonians (ABC) is one of the UK's only authentic live calypso venues. It takes place annually during the summer in the run-up to the Notting Hill Carnival. As a visitor in past years I can highly recommend The Tent for its great atmosphere and music. If you are lucky you may even get to hear some "extempo" (extemporaneous improvisation). This year The Tent is moving from its old home - The Yaa Asantewaa Arts Centre in Maida Vale - to a brand new one: The Tabernacle in Powis Square. This venue is the home of Carnival Village - a new organisation formed to support carnival arts in the UK and comprising the Ebony Steelband Trust, Mangrove Y2K, the Association of British Calypsonians, and Yaa Asantewaa Arts.